Think your biodegradable bag is biodegradable? Think again. If you’re like me, you bought biodegradable bags because you thought you were helping the environment. You probably imagined that plastic bag magically disappearing in the landfill unlike those other plastic bags, right? But biodegradable does not mean compostable (in fact, there’s no regulation around what “biodegradable” even means). And so-called biodegradable bags are no better than regular plastic bags—in fact, they’re worse. The bag pictured above is my last bag from a roll of NaturSac bags I purchased long before going zero waste. I’d used this bag repeatedly as a liner in my kitchen compost bin, but it was starting to leak. I wasn’t sure how to best dispose of it since I no longer had the packaging. The bag itself says it’s biodegradable, non-polluting and recyclable, and I was hopeful I’d be able to compost it. An article in the Globe and Mail touted NaturSac bags as “A compostable garbage bag for the eco-minded grocer.” I decided to call NaturSac to find out the best way to dispose of the bag. What I discovered will make your blood boil (or at least it did mine)! First off, the NaturSac representative told me the bags are NOT recyclable despite saying so on the bag. They said Recyc-Québec won’t accept the bags so they’ve removed that labeling on newer bags. (Most biodegradable bags aren’t recyclable since they contaminate the plastic recycling). So then I asked if there were any collection sites where I can drop off NaturSac bags for recycling. Nope. She said if I want to dispose of the bag, I can either throw it in my trash can or I can leave it on my lawn for a year under a rock so it won’t blow away while it degrades. What?! It’s upsetting that a Quebec company would say their bags are recyclable when they’re not accepted by Quebec recycling programs. After our conversation, I decided to head to the grocery store to see if NaturSac actually did remove the “recyclable” label from their bags. NaturSac also claims their bags are “non-polluting” because the green-colored ink they use to print all these false claims is water-based. This completely ignores the fact that the entire bag is plastic! You can put lipstick on a pig, but it’s still a pig. Beyond calling their company NaturSac, they also found ways to include the word “natural” wherever possible to give the impression that these bags are somehow good for the planet. They describe their plastic bags as “natural” because plastic is naturally transparent and they don’t add dyes to it. I’m sorry, but see-through plastic isn’t natural. Nice try. They also managed to invent a phony symbol called “The environment reflex,” to suggest that this bag somehow meets some sort of environmental criteria. Nope. And to give you the impression that you’re reusing something, NaturSac happily implies you’re giving your plastic bag a second life by using a pet waste bag as a pet waste bag. Huh? What was its first life exactly? And for the finale, they printed “pour l’avenir de nos enfants / for our children’s future” on a plastic bag full of lies. Honestly, the whole bag makes me want to vomit. What about other brands of biodegradable compostsble bags? These are the soft green material that breaks easily when wet. They are being used at our California Trader Joe’s for produce bags and also are available to buy as garbage bags in several sizes. They feel like s non plastic material. Did you research those? Hi, Leah! I haven’t researched those yet. Can you send me the link? It would be a matter of determining what the bags are made of and where they can be composted (industrial vs home compost). Your Mum sounds awesome! Yes, many companies claim their products are “biodegradable” because they break down into smaller pieces (ughh), and well-intentioned consumers fall for it. Bravo to the customers for putting pressure on the supermarket! Have you tried If You Care trash bags? Hi, Karl! I haven’t tried them. While the bags are technically compostable, they’re only compostable in industrial facilities—not in backyard composting bins. Since I don’t have access to industrial composting facilities, these bags aren’t compostable for me. 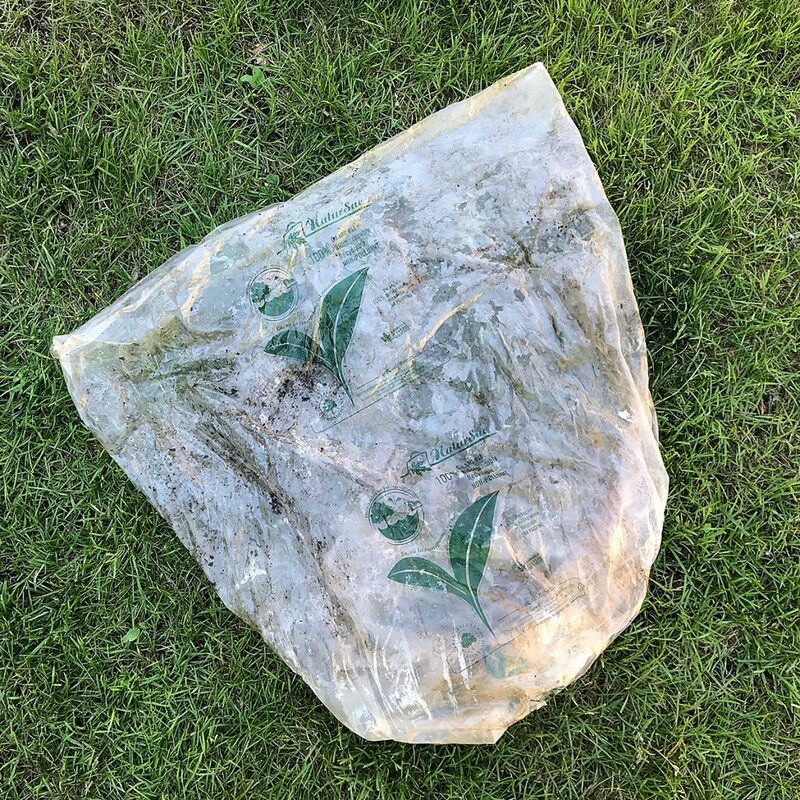 Unfortunately, compostable bags are only compostable in municipalities that have large-scale composting set up—and even then you’d have to check to make sure they accept this type of compostable bag. It’s sort of like how all plastics are technically recyclable, but if your town doesn’t collect it, it’s not really recyclable for you. AMS Compostable bags are OK Home Compost. I am a environmental engineer and it does work on my home compost garden. I’ve pictures if you want.